Armstrong President Linda M. Bleicken, center, and Georgia Governor Nathan Deal, to the left, joined more than a dozen dignitaries at a special groundbreaking ceremony for the new Armstrong Liberty Center in Hinesville, Ga.
Armstrong State University, a leading public university with locations in Savannah, Ga. and Hinesville, Ga., officially broke ground earlier today on the new Armstrong Liberty Center in downtown Hinesville. More than 200 community leaders, political dignitaries, faculty, staff and students attended the groundbreaking ceremony. 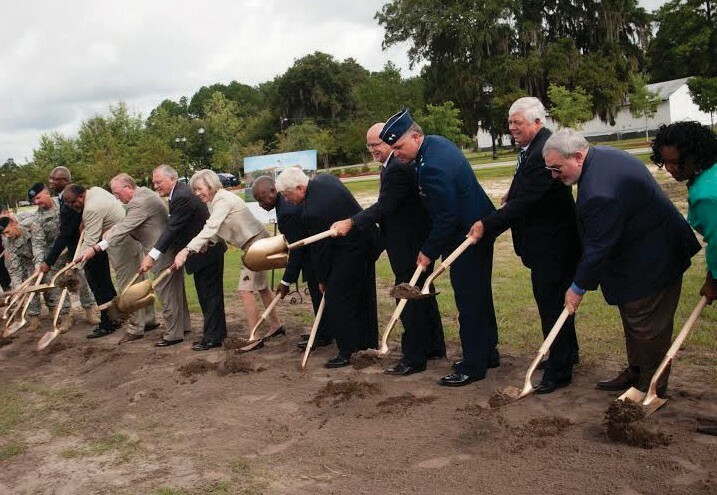 Georgia Governor Nathan Deal, University System of Georgia Chancellor Hank M. Huckaby, Hinesville Mayor James Thomas, Senator Jack Hill, Representative Al Williams, and Georgia National Guard Maj. Gen. Jim Butterworth addressed the audience at the groundbreaking ceremony. The Armstrong Liberty Center has experienced a 20 percent increase in enrollment for the past two academic years, demonstrating the growing demand for a larger building in Hinesville. The new Armstrong Liberty Center will offer 21,000 square feet of learning space at the corner of Memorial Drive and Welborn Street in downtown Hinesville, replacing a smaller leased facility on East General Stewart Way. T h e Armstrong Liberty Center currently offers associate degree tracks in liberal studies, criminal justice, business and a variety of health profession areas, as well as bachelor’s degrees in liberal studies and criminal justice. The state-of-the-art expanded facility will include classrooms, science laboratories, faculty/staff offices, common areas, student services and support areas. The building’s design will be sensitive to the aesthetic fabric of the existing community and will complement the existing downtown streetscape.